The prey of killer whales (Orcinus orca) in the Arctic is little studied, except of course by native Inuit peoples. New research has used a novel technique to introduce us to, or provide an insight into this Inuit science, if you like. They certainly know their business, which in this case involves their competitor for prey items, the killer whale. The Inuit have always relied upon marine mammals for their basic survival. Food, clothing and transport all came from raw animal products. Local Orcinus orca in the north-east Pacific were feeding on fish, while humans used different mammalian prey. But in eastern Canada, nobody seemed to know what the local Orcinus orca ate. The effect of global warming is now changing that equation. While some Inuit communities still rely on customary sources, the whales have found that warm water provides new populations with different diets around Hudson Bay, where loss of sea ice is very evident. Traditional Inuit stories are informative about the killers' diet in Foxe basin (bowhead whales) and Baffin island (narwhal). Even the Orcinus orca hunting techniques are minutely described. 1. There was little prey specialisation beyond the use of marine mammals including phocid seals, narwhals, beluga and bowhead whales, in that order. 2. No fish were consumed according to most interviewees, with only seven relating none-first-hand experience of fish eating. 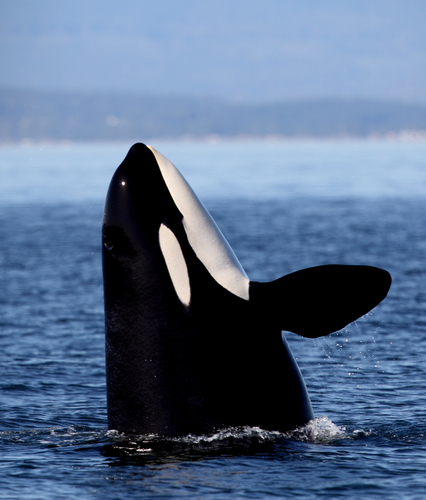 As top predators, Orcinus orca are important to conservation of marine ecosystems. The eastern Canadian ecotype of Orcinus orca is obviously a mammal-eating one, during the open water season. Following up this Inuit interview research technique, we can hope to discover more about how to conserve the fauna, especially when we consider the natural winter ecology of the killer whales. Now there is open water for most of the year, it could be that calves of whales, such as bowheads, will be even more vulnerable than previously. Equally, we need to know how killers feed in the winter - do they migrate or exist on fish? It's fascinating to see if this kind of research can fill in the details needed for adequate conservation action, as the ice slowly melts. The full research paper was published this week in the journal Aquatic Biosystems.